In my last post, I talked about how to keep Google from indexing your development or staging site. But if it’s already happened, here’s how to fix it. Heads up: The following fix requires that you basically kill your dev site. If you still want to have a dev or staging site, pick a different subdomain and put it there. Then follow the instructions here to make sure this doesn’t happen again. First, add both domains to Google Search Console. Go to Google Search Console (formerly Webmaster Tools) and add and verify both properties (if they’re not already added). 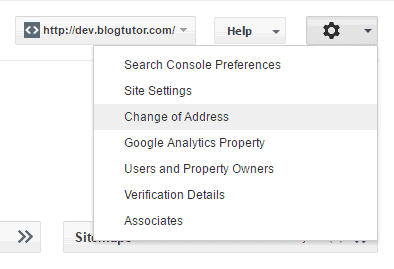 From the main page of Search Console, hit the red “Add a Property” button and follow the steps. For the dev site, I recommend using the “Domain name provider” verification method (it may be under the “Alternate Methods” tab). The other verification methods may not continue to work after you set up the redirects in the next step. Follow the instructions that Google provides for your DNS (Domain Name Service) provider. Your DNS settings are probably managed by your web hosting company. However, they could also be managed by your domain registrar (such as GoDaddy or Namecheap). If you’re using Cloudflare, you’ll need to change the settings there. Second, redirect the dev site to the real site. You’ll need to set up 301 (permanent) redirects in your .htaccess file. This is a simple text file that sites in the top folder of your server (usually something like /public_html/) . This will direct both visitors (real people!) 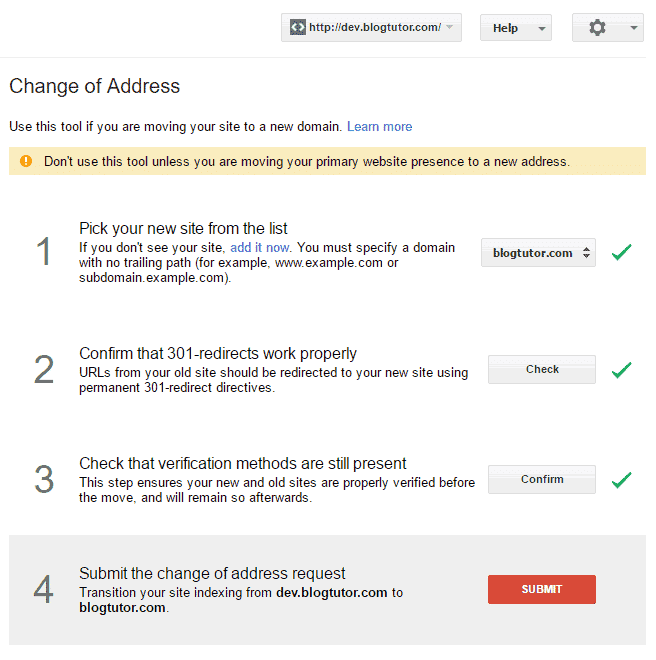 and Google to the correct site, with a status code of 301, which indicates you intend this to be a permanent change. Although it looks scary, it’s not actually that complicated. The first line just tells the server that you’re about to do some redirection. The second line checks to see if request is for the dev site. The third line says that if it is, redirect the visitor to the correct domain (including the full URL). Of course, you’ll need to change yourdomain.com to your actual domain to get this to work. Once it’s in place, be sure to test to be sure it redirects everything correctly (including posts/pages, not just the homepage). If you’re scared to edit your .htaccess file, I recommend asking your host to take care of this for you; they should be happy to help. Third, submit a change of address to Google. You’re going to need to be patient. Very patient. It can take months to untangle this mess. Google has to crawl the site, follow the redirects, learn that the final URL is actually the correct page, and then update the index accordingly. I fixed a client’s site eight months ago, and there are still more than a dozen links that show up in the index. But don’t worry, all is not lost! Even if Google continues to show the wrong domain for awhile, the redirect in step 3 will ensure that your real visitors still make it to the right place on your site. To keep tabs on how the fix is going, you can search site:dev.yoursite.com and check out the search results. Note the number of results returned. Over time, it should go down and eventually reach zero. Hi! Thank you for you post but I still have one question. If the redirect is ON how can I access the dev website to check if this staging environment is working as expected before switching to live? Hi Francisco – Good question! The idea is to set up the redirect after going “live” with the changes, and would only be necessary if Google had already indexed your dev site. Hi Evgen – That can be a useful tool, but I don’t typically recommend it… If your dev site is showing up in the SERPs instead of your live site, I’d much rather just set up redirects — that way any real traffic will actually make it to your live site. If you just have Google remove the dev site URLs, there may be a significant lag time before your live site starts showing up in the SERPs – which could lead to a drop in traffic. I think it all depends on just how “indexed” the dev site is — if it’s just a few URLs, doing the manual removal may be a good choice. If it’s all the URLs on your site, I’d go with the redirect method. Andrew, I dove in and followed your guidance, so we’ll see what happens! I completed the change of address today, made note of my current findings regarding the indexing of my site, said a little prayer, and now I’m in patience mode. Hopefully it will rebound sooner rather than later, and I’ll report back as to the relative success of the process! my google webmaster tools don’t show correct visitors last one month. my google search click is daily 150-200 but my search console show only 3-4 click this period. Make sure you’re looking at the exact, correct URL in Search Console, including http or https, and with (or without) the www. So if you’re looking at a slightly different URL the reports will be incorrect. Yes I have treated all four variations differently in the search console. This recently occurred to one of my sites. At the same time of discovery my organic search results started falling. I’m assuming the issues are related. Is this common and would it look like duplicate content across sites to Google thus the ‘penalty’? So Andrew, why not once the site is verified, I should rather use url removal tool and then set up some kind of server authentication like login id to see the page from out of our ip address? nice blog sir. I have a question my dev site got indexed along with all tags and categories. I don’t have a website where i can redirect them as my client refuse to purchase the website. If i delete the website than also my indexed pages will not be removed. What should i do. Please suggest waiting for a perfect solution withthis issue. This is great and thanks for the tips. What do you do if you are trying to submit a name change on the DEV site and you get this error: Restricted to root level domains and subdomains only. I have tested that the 301 redirect is working, is that enough to let google know that the site is no longer the main site? It does the job for the homepage, but it does not redirect sub pages. Do you know what to change to the above lines of code to also redirect sub pages from staging to live? Hi Marc. I haven’t tested this, but I’m guessing this would do what you are asking. The first two lines are the same as what you shared; I’ve modified the RewriteRule on the third line. That’s a regex (regular expression) pattern match and backreference. What that means is that it searches for the part of the URL (after the domain name) and then moves it over to the new domain. And then whatever it finds in ^(. *)$ will be added where the $1 is.